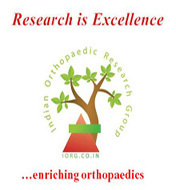 Insights from a Personal Journey in field of Orthopaedic Research and Publications. Plagiarism- Cut it at the roots. Beware the Emergency Ankle Fracture Referral: An Unusual Case of Lateral Subtalar Joint Dislocation Secondary to Calcaneal Fracture with associated Lateral Malleolus Fracture. Late Disassembly of Femoral Head and Neck of A Modular Primary Total Hip Arthroplasty. Treatment of Large Recurrent Bilateral Xanthomatosis of Achilles Tendon- A Case Report. Multiple Skin Abscesses and Myofibrosis of Bilateral Lower Limbs Following Repeated Intramuscular Injection of Pentazocine with Concomitant Tuberculous Infection. 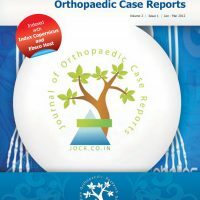 Use of Ilizarov Fixator for Grade III B Open Olecranon Fracture: a Case Report and Surgical Technique. Fibrodysplasia Ossificans Progressiva: Difficulty in Diagnosis and Management A case report and literature review. A Rare Cause of Postoperative Bleeding from A Lytic Lesion of Calcaneum. Peroneus Brevis Attrition & Longitudinal Split Tear without Subluxation and Associated Hypertrophy of Peronal Tubercle” – Treatment of an Uncommon Lesion. Self Regressing Epitheloid Haemangioendothelioma of Tibia in an Infant- A rare case report and review of literature. Osteofibrous Dysplasia managed with Extraperiosteal excision, Autologous free fibular graft and bone graft substitute. Bizarre Parosteal Osteochondromatous Proliferation causing angular deformities: A Case Report. Successful Correction of Idiopathic Bilateral Flexion Deformity of Knee: A Rare Case Report. Giant Cell Tumour of Distal Fibula Managed by En Block Resection and Reconstruction with Ipsilateral Proximal Fibula. Acute spontaneous atraumatic bilateral anterior dislocation of the shoulder joint with Hill-Sach’s lesions: A rare case. Chronic Tendonopathy as a Unique Cause of Non Traumatic Triceps Tendon Rupture in a (Risk Factors Free) Bodybuilder: A Case Report. Osteochondroma of the Rib: a rare radiological apeareance. Volkmann’s Ischemic Contracture with Atrophic Non-union of Ulna Managed by Bone Shortening and Transposition of Radial Autograft. Technical note on Modified Posterior Approach to the Hip Joint. Traumatic Posterior Dislocation of the Radial Head in an Adult : A Rare Case Report.